10 Steps to Planning a Memorable Accessible Caribbean Cruise! What are your 2016 vacation plans? Have you considered cruising through the beautiful crystal blue Caribbean waters while experiencing rich culture, island atmosphere and tropical nature all at once? Not only do cruises offer great value for your vacation dollar because they usually include everything you’ll need to have a great time: accommodation, food, entertainment and transportation between destinations, it’s also one of the most convenient ways for disabled travelers to see multiple destinations in a short amount of time. Many large cruise ships have great onboard accessibility features, your accessible accommodation stays the same throughout the entire vacation and accessible shore excursions makes exploring landside easy and convenient for you. 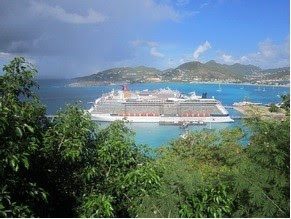 Beautiful view of cruise ship and coastal line in St.Maarten. Your camera will be working overtime during your accessible Caribbean cruise! 1. Check the accessibility of the ports before you book – It’s important to remember that even the least accessible cruise ship is better than the most accessible port! On board the ship you have shorter distances, no hills, no cobblestones, no difficulty finding accessible bathrooms etc. but you’ll still want to make sure you don’t end up trapped on the ship while other people go ashore. Focus on the itinerary and destination ports rather than just on the ship! Where does the ship dock? Is the cruise terminal and port exit wheelchair accessible? What is the terrain like? Is there any accessible transportation available? How far are the main attractions located from the cruise dock? 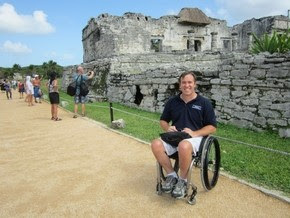 Are there any accessible shore excursions available? To make the process easier for you, check out our detailed Caribbean Port Accessibility Reviews for the most popular Caribbean cruise destinations including Aruba, Nassau, Grand Cayman and St. Thomas! 2. Choose a cruise line and itinerary whose passengers have similar travel preferences – It’s important where the ship takes you… but it’s also important to consider what kind of cruise ship you want to travel on. Do you want loud and fun, or do you want quiet and relaxing? Do you want to be with adults, or do you want a kid-friendly cruise? You literally have a sea full of options! 3. Choose your accessible cruise length – Cruise lengths vary drastically… are you looking for a short 4 night getaway with one accessible beach excursion in Cozumel or maybe a 12 night fully loaded Southern Caribbean trip with several stops and excursions? 4. Decide on cruise ship size – Cruise ships come in a variety of sizes! Smaller ships usually means shorter distances to travel onboard, which can be beneficial for disabled passengers who can’t walk long distances. Be aware that the smaller ships typically are more luxurious and consequently cost more. 5. Check the number and types of accessible cabins as well as their location on the ship – The number of accessible staterooms onboard cruise ships is limited which means you’ll have to start planning as soon as possible in order to secure one of them. Are there accessible cabins available in the stateroom type that you want? Interior, window, balcony, or suite? Will the stateroom suit your accessibility needs? Also, remember to check out where the rooms are located. If you’re too close to the elevator, you’ll hear noise all night. If you’re too far away, you’ll have to navigate narrow pathways past linen carts during the day. 6. Check accessibility of the pool and theatre – In the theatre, make sure to check if there is only accessible seating at the back of the third level, or if you can get somewhere different with a better view. Also make sure that at least one of the pools onboard has a disabled lift to get into the pool. The same goes for the hot tub! There is simply no point in booking a cruise with state-of-the-art amenities onboard if you can’t fully enjoy them. 7. Check which side of the ship has the best views for the itinerary – Depending on where you are going, you’ll want to be on the port side of the ship so you can view the beautiful coastal towns from your balcony. In the reverse direction you’ll want the starboard side. 8. Monitor cruise promotions – Cruising can easily be one of the most inexpensive ways to travel, especially if you are open regarding your travel dates and spend some time monitoring promotions on package deals. Also, sometimes booking through a travel agent can save you money because they have special promotions available that you won’t find elsewhere. At Accessible Caribbean Vacations we don’t just offer you great discounts on your accessible cruises. 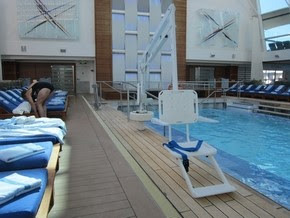 The cruise lines give us onboard credits and other amenities and we pass them directly on to you! 9. Book your accessible cruise and remember to purchase travel insurance! – Once you’ve found a suitable, accessible, exciting cruise itinerary, a ship that fits your accessibility needs and travel preferences, and a good promotion of course – it’s time to book your cruise! Some cruisers think that travel insurance won’t be necessary when you go on a cruise but that’s not correct. As with all other international travel, especially for disabled travelers, travel insurance could end up saving your vacation in case of any unforeseen events or sickness. Less worry means more time to enjoy! 10. Book accessible excursions – While you should’ve looked into your accessible excursion options before booking the cruise, now is the time to make the final reservations. If you are traveling during popular vacation dates and holidays, accessible tours and van transportation could get scarce in some ports. Make your excursion reservations at least two months in advance to be on the safe side. Did you know that Accessible Caribbean Vacations can help you plan all aspects of your accessible cruise? There’s no need for you to spend countless hours of research and risk making a decision on missing or incorrect accessibility information! Deciding on the cruise itinerary, choosing accessible staterooms, booking memorable accessible experiences onshore, and getting you great travel deals…we’ve got you covered! 2016 memorable accessible Caribbean cruise!